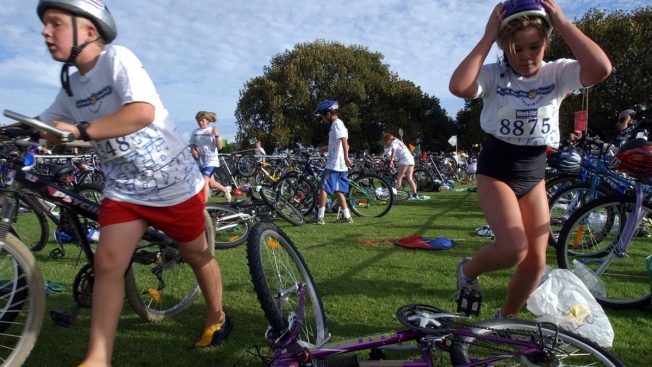 In this March 10, 2002, file photo, children participate in a triathlon, where they will swim, bike and run for fun. A youth triathlon program founded by the family of a child killed in the Sandy Hook school shooting is expanding with the help of a national organization. The Race4Chase training program is a free camp designed to promote healthy lifestyles by teaching kids how to swim, ride a bike and run. It's run by the CMAK Foundation through local YMCAs. The foundation was set up in memory of Chase Kowalski, a 7-year-old who competed in his first triathlon months before the 2012 massacre. Race4Chase announced this week that it's partnering with the USA Triathlon Foundation to help grow the project, with the goal of having Race4Chase triathlons nationwide. The program expanded from three camps in 2013 to 27 sites this year in Connecticut, Rhode Island, South Carolina and Washington D.C.